Hammersmith and Fulham Urban Studies Centre is now in its 31st year of working with young people and adults in the borough. Our organisation was originally formed from the council’s planning department way back in 1983, with the aim of engaging young people with planning process in our ever changing borough. Since that time, our borough has changed a huge amount and we have developed and grown also. We are now an independent charity with the aim of offering learning opportunities outside the classroom, to help young people learn more about the urban environment in the West London area. Much of our work is with schools, offering hands-on, enquiry based, learning outdoors, like discovering wildlife on the foreshore of the River Thames, uncovering the secrets of our borough in World War One and mapping the geographical changes since Hammersmith was a small riverside settlement. in the council chamber of Hammersmith Town Hall to present their project to their peers and to adult guests. We also run an annual Bi-borough Children’s Choice conference, in partnership with Epic Youth, bringing together children from both boroughs to Kensington Town Hall, for a day of discussion and activities. 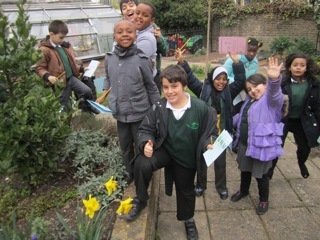 This year also we ran Young Friends of Parks groups throughout the borough, connecting children who do not have their own gardens with their local park and its plants and wildlife. Children have strong views about what they like to see in their local parks and they relished having the chance to meet with the parks police and other informed adults to offer them their suggestions for improvements. 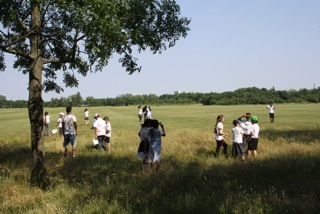 We enjoy working with adults too, and regularly lead informal, sociable walks, encouraging people to learn about and enjoy their local green spaces, along our wonderful riverside with its rich heritage, over the wilds of Wormwood Scrubs and its seven areas of nature reserve (with its elusive resident population of lizards!) and through the peaceful, leafy Margravine and Brompton cemeteries. 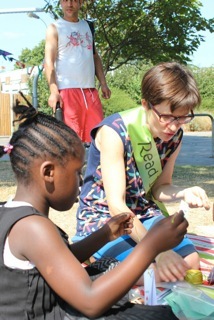 and listening to stories, as well as gardening, taking part in a literacy trail, learning crafts and enjoying family games. 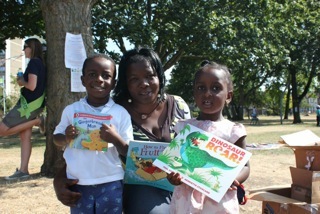 This was a successful collaboration, supported by Dr.Edward and Bishop King Charity, between ourselves, Hammersmith Community Gardens, The Doorstep Library Network and Thank U. It is amazing what the voluntary sector can do when we work together! What’s new with the Urban Studies Centre at the moment? Well we are just beginning a new tri-borough project, working more with young people in Westminster and Kensington and Chelsea and getting them out and about learning in their local area. Our AGM is on Tuesday 23rd September 4.30 at the Lilla Huset in Talgarth Road. W6 8BJ. All are very welcome, so do come along and meet us! This entry was posted in Parks, Schools, Volunteering. Bookmark the permalink.